H&L PROMOTES AN EDUCATIONAL, PRODUCTIVE, AND FUN WORK ENVIRONMENT. Culture at H&L has evolved and been ‘baked-in’ to our DNA over 25 years of respecting our clients, our profession, and each other. Our outreach to MUST Ministries spearheaded by our annual fundraising golf tournament, the time that staff spends working with K-12 and college students, our broad visibility and commitment to the various professional societies, and our internal social and recreational activities are all evidence of that culture. 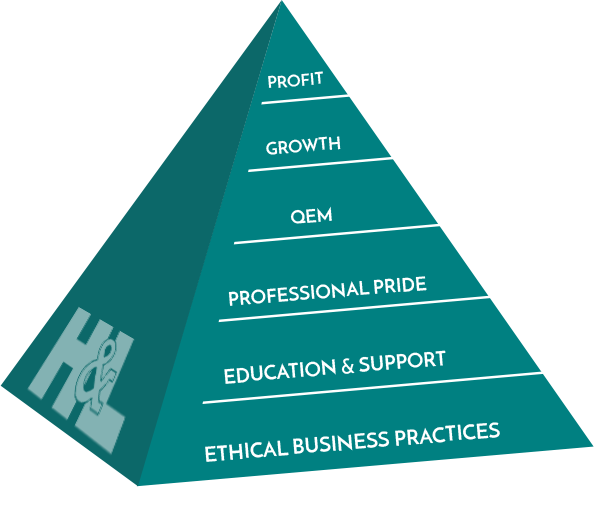 “The philosophy at H&L is to realize the vision, meet the mission and ensure profitability of our company by building our business on a core belief in ethical practices enhanced by a policy of education and support for our staff. Our philosophy fosters a foundation of professional pride in what we do, and what we do is controlled by a structured Quality Engineering Method. We hire, groom, and develop our staff to provide a broad based staffing resource. We match the ideally qualified staff member to a project, asuring the work is completed effeciently. We understand our strengths and we provide service within those strengths. Our firm has designed major, complex transportation projects and our senior staff has worldwide experience. Our younger staff, therefore, is exposed early on to a wide variety of project types and challenges. Mature individuals – a mature firm. Since 1994, we’ve built a team that offers a great knowledge base and hands-on, experienced sounding board. Quality is the delivery of service in accordance with the expectation of our client. We provide in-budget and on-schedule delivery of a product that is accurate, economincal, safe, well documented, and professionally presented. We communicate clearly, concisely, and often, with a strong management team and principals who remain visible and accessible to our clients. Our approach to project management is both nimble and flexible, with a staff that responds immediately to client or project needs. Professional pride pervades all we do. It is our responsibility to unburden our client by taking ownership of the challenges of each project. Our promise is a personal and corporate commitment to ethical behavior, honesty, impartiality, and sincerity. Value Engineering to find the best solution.